Chip Chocoholic (better known as Chip) is a bay American Quarter Quarter Horse gelding donated by Mrs. Betty Murfin and Nancy Murfin Moxley. Chip is something of a superstar, not just at Horses of Hope but in the AQHA show world as well. Before life at HOH Chip had been shown extensively in AQHA Youth and Amateur events and has an impressive list of show point earnings, has been a World Show Qualifier, World Show Top 10 and Was the Winner of the Quarter Horse Congress Youth Western Riding in 2001! Since joining HOH Chip has continued his winning ways. He was the AQHA Equestrians with Disabilities High Point Horse in all 4 EWD events in 2009 and the high point in 3 events in 2010. We are grateful to Mrs. Murfin and Mrs Moxley for allowing Chip to continue his winning ways at Horses of Hope! 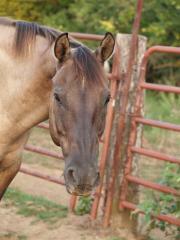 Chip has been partially sponsored for 2014 by Art Brown and Tina Ogle. Thank YOU Art & Tina for supporting Chip in his work at Horses of Hope! This palomino, American Quarter Horse gelding was donated by Marcia Gillespie of Oklahoma. Romeo is a retired reining horse, hence the long beautiful mane. Romeo came to Horses of Hope in 2008 and very quickly took to life as a therapy horse. He immediately became a member of the Show Team HOPE. This year Romeo not only took his riders to World Championships at the Pinto and Buckskin World Championship Shows, he was the 2008 AQHA Equestrians with Disabilities Year End High Point horse in trail. To see Romeo at a show with his mane combed out and shining, you might think he is a prima dona, but he is really a rough and ready boy who loves to play with his buddies in the pasture. Get A Grip (Better known as Grip) is a gruella, American Quarter Horse gelding donated by Margaret and Alan VanSkike of Diamond, MO. Grip is one of the cornerstones of our program and Vallerie says he is her “go to man” when she has someone new or challenging to begin the program. Grip is a retired show horse who cross trained in both western and dressage. Grip’s unique color and delightful personality make him a favorite of many of our riders. Grip has taught many of our riders that they can ride independently, giving them the confidence they need to advance their skills. Grip has been Completely sponsored for 2014 for by these wonderful people! Abi Brown, Sidney Morgan, Loren & Sherry Yoder, Dr. Melinda Mayfield, Jane Anne Porter, NEO Equine Club and Sherrie & Rick Pledger. THANK YOU ALL for supporting Grip in his important work at Horses of Hope! Frosted Tear Drop (Better known as TD) is a Paint mare donated by Caroline Frogge of Joplin, MO. TD has a long history with Horses of Hope. When we began in 1997, TD was not a therapy horse, but a show horse for a very young Mycah McColm, who was then riding in walk trot classes. TD was sold to Caroline Frogge in 2001 as a beginner horse for her. 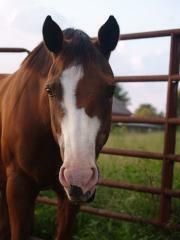 When Caroline grew up and moved on to other horses, she graciously donated TD to Horses of Hope. TD is a solid and reliable horse. Although she is small, only 14.1 hands high, she has a walk of a much bigger horse which is a wonderful combination in a Hippotherapy horse. TD often has the reputation of the grumpy mare of the herd, but her heart is as big as they come, and she always puts her best hoof forward when she’s working. These gracious supporters have fully sponsored TD for 2014. Tammy Willcox, Patty Jessie and two annonymous donors. Thank YOU!! 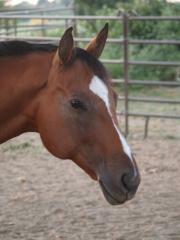 SS Charlies Machine (better known as Charlie) is a bay American Quarter Horse mare donated to HOH by Jennifer Walker. Charlie is a big stout mare with a big personality to match! 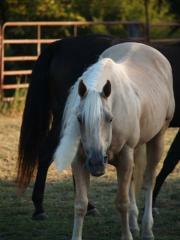 Charlies is actively used in the therapeutic riding program and is one of the stars of our Show Team Hope. She has earned the reputation as something of a “diva” around the barn. She wants to be the first one fed, the first one brought in, the first one to go out…you get the idea. But when she is in the riding ring or show pen, she really lets her talents shine through. She takes good care of her riders and is very attentive to what is happening and what she needs to do. This makes her “diva” behavior tolerable! 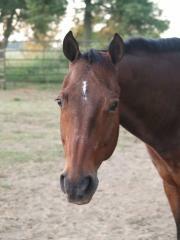 Charlie has been sponsored for 2014 by Abigale Brown. Thank You for taking care of Charlie this year!